In lieu of flowers donations may be made to Muscular Dystrophy in memory of Caroline Eaves and left at the funeral home. Alma Caroline Eaves, age 79, of El Dorado Springs, Missouri, passed away on November 30, 2010 at Cedar County Memorial Hospital. Alma was born in Stockton, Missouri, on March 29, 1931, the third child of Silvia Lee (Taylor) and Ira Leroy Swager. 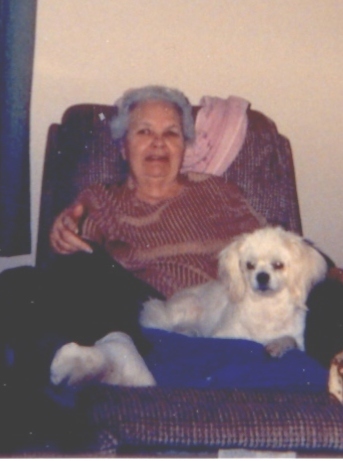 She lived most of her life in Cedar County and graduated from El Dorado Springs High School in 1950. The same year she married Jerry Lee Eaves. To this union two children were born: Jerry R. and Jeannie K.
Caroline worked at the International Shoe Company for over 24 years. Jerry and Caroline owned a tavern before retiring in 1990 and moving to Cedar Springs, Missouri. She spent most of her time with her flowers, doing crafts, and making quilts and teddy bears. Preceding her in death were her parents; her husband Jerry; son Jerry; son-in-law Dennis Hertzberg; and brother Leland. Survivors include: one daughter Jeannie Hertzberg of El Dorado Springs; one daughter-in-law Debbie Eaves of Florida; four grandchildren: Jason, Jessica, Angie and April; five great-grandchildren; and one sister Juanita Swager. A memorial service will be held at Bland-Hackleman Chapel on December 11, 2010, at 1:00 p.m. with Rev. Brent Bland officiating. Caroline’s cremains will be placed by Jerry’s at Mound Cemetery under the direction of Bland-Hackleman Funeral Home.